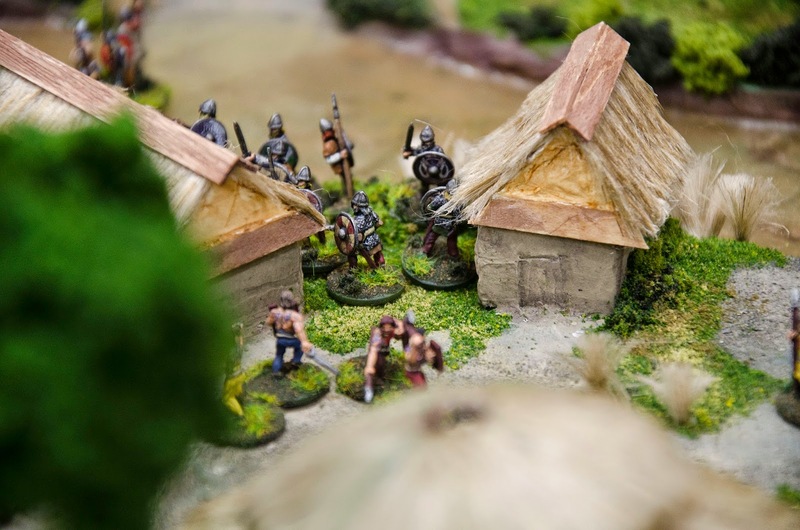 Uncertain loyalties rule the day when Hadwin Hairy-Breeches and his half-brother, Snorri Most-Beard, raid a Pictish farmstead. The brothers haven't stopped sniping at each other since they left their home fjord, but the heat of battle will test their familial ties once and for all. 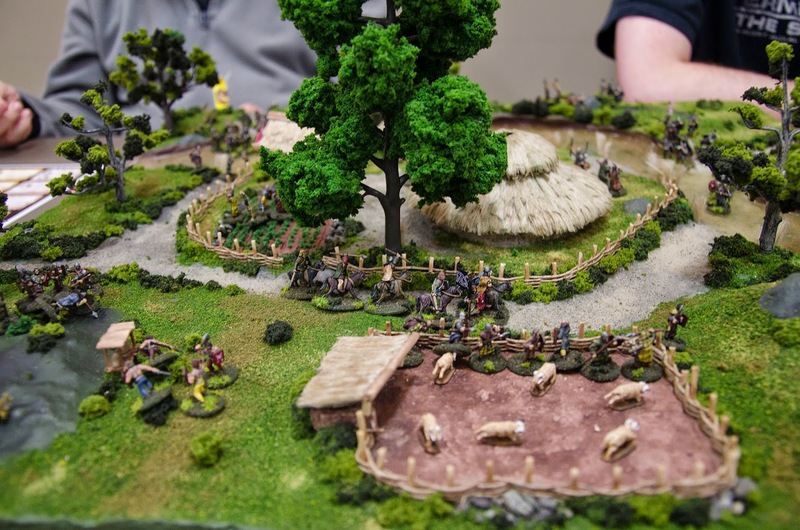 Defending the farm is an equally divided band of Picts - how far can Drosten the farmer trust in the aid of Onuis, his neighbor, when Onuis has made no secret of his lust for Drosten's lands? It’s time for some new wives! You have traveled across the vicious seas for days, and you have one thing in mind: capture some slaves to bring home for sale. Your half-brother, Snorri, though, has been argumentative and disrespectful for the whole journey. He would bear watching. 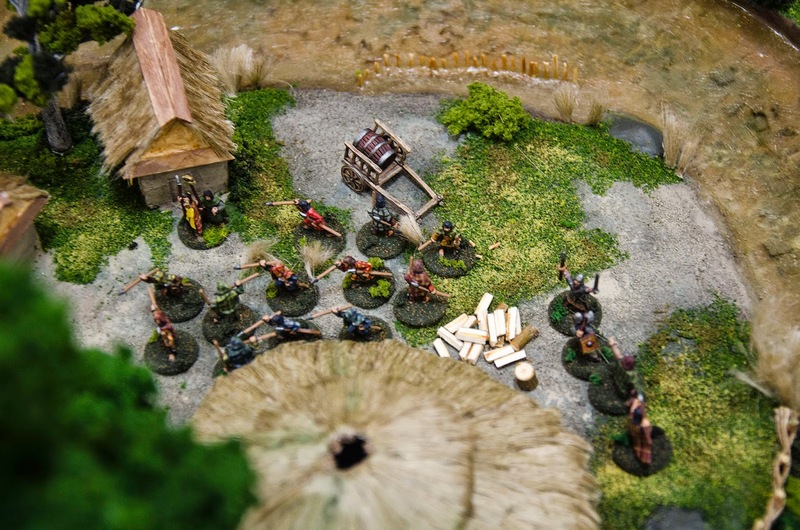 Each unit that stays in contact with one of the buildings in the farmstead (that is not occupied by fighting men) for one full turn may capture its inhabitants. Each batch of inhabitants you carry off the board (by any edge) gives you +3 VP. It has been nearly a year since your last raid, and you can already feel the red mist descending. But here’s Hadwin again, trying to tell you - you! - what to do and how to fight, just like when you were children. Well, you didn’t come all this way to line his pockets with slaves and plunder. You came here to do one thing: wet your sword and dance in the flames. 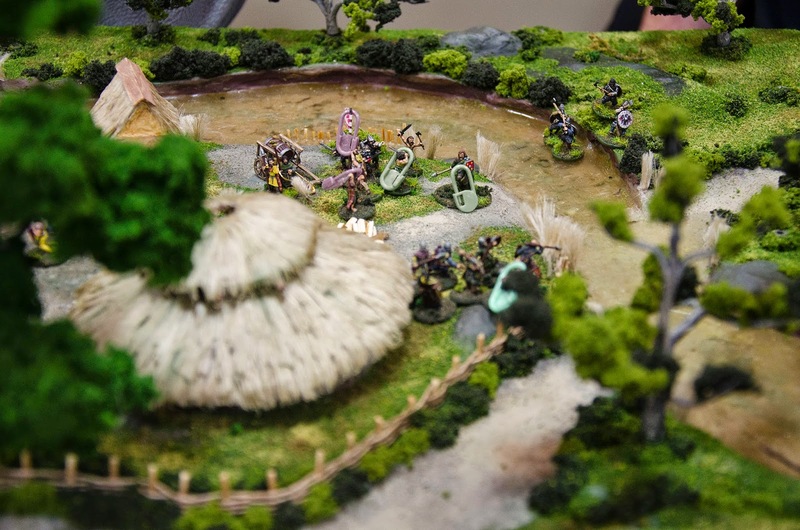 Each unit that stays in contact with one of the buildings in the farmstead for one full turn may light that building on fire, OR slaughter its non-combatant inhabitants. You may not slaughter the inhabitants of a building if that building is on fire. Each burnt building or group of slaughtered inhabitants gives you +2 VP. The northmen have come! You have secured the women and children in the hall and outbuildings, but the walls are thin and the thatch is dry. You have sent for help from Onuis over the hill, but he’s had designs on your lands for years, and you don’t know how far you can trust him. There’s only one thing to do: muster your men and try to keep the northmen from stealing or destroying everything you value. 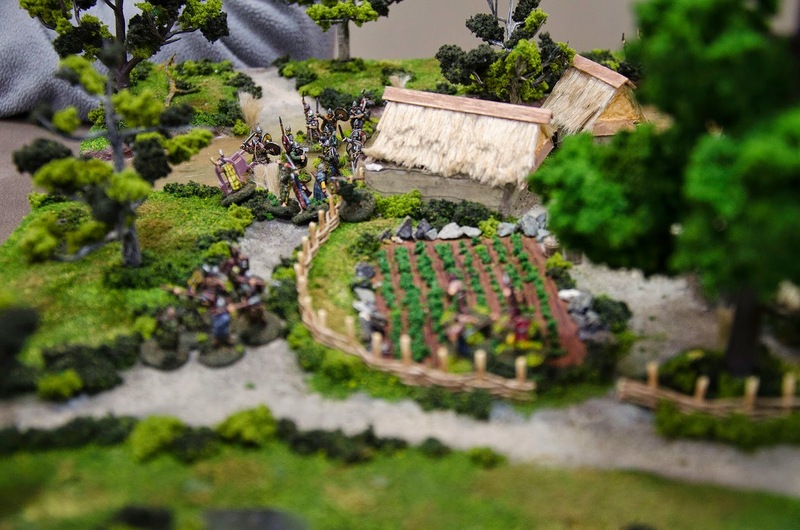 Each building in the farm that remains intact, with living inhabitants, by the end of the battle, earns you +3 VP. 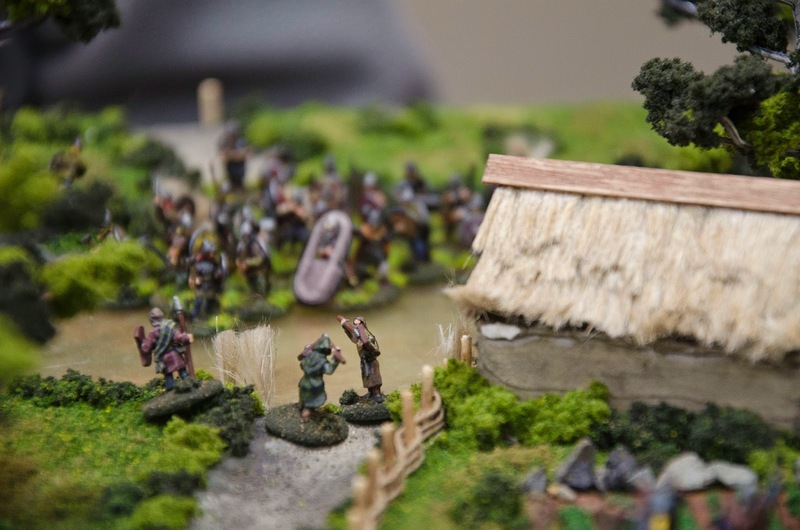 Each group of Drosten’s people that is kidnapped or slain by the northmen grants you +3 VP (no, you may not kidnap or slay them yourself), but each of his buildings that burns costs you -2 VP. 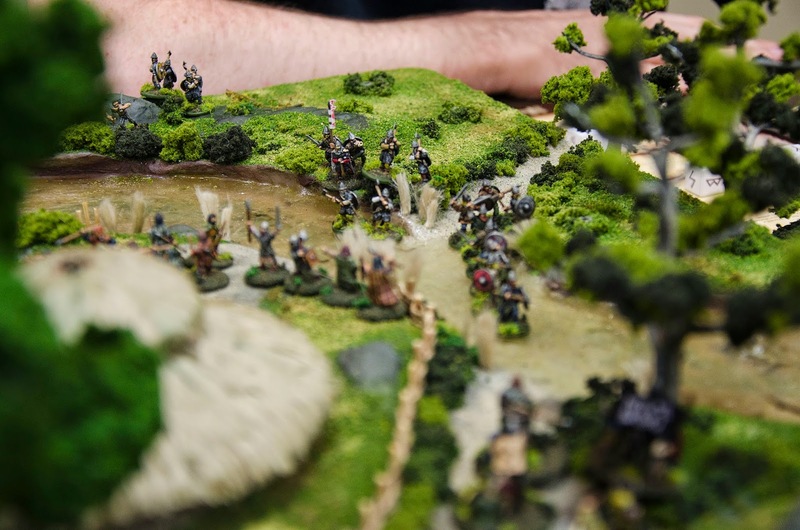 A band of bloodthirsty Northmen appear and charge across the ford. Onuis and his liegemen arrive and charge on ponies to head off the Northemen at the right ford. 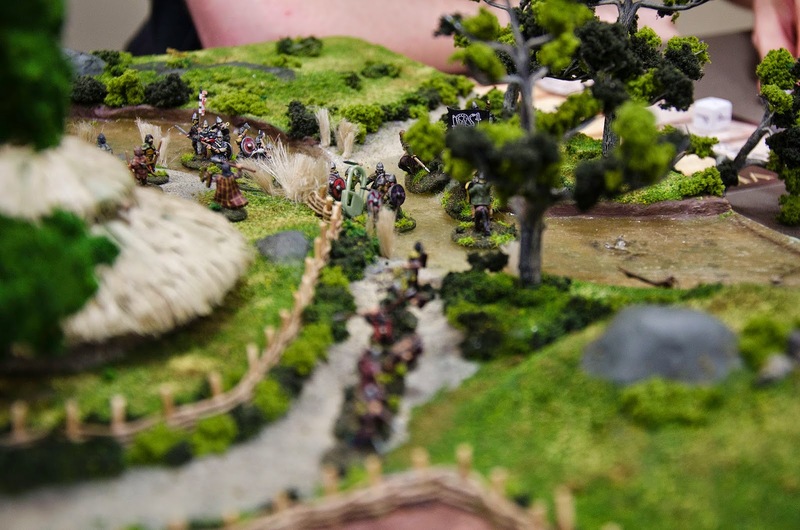 another group of Northmen mass across the stream! The bigger picture: it's a small board, but works just fine for a 4-way game. deeper part of the stream. 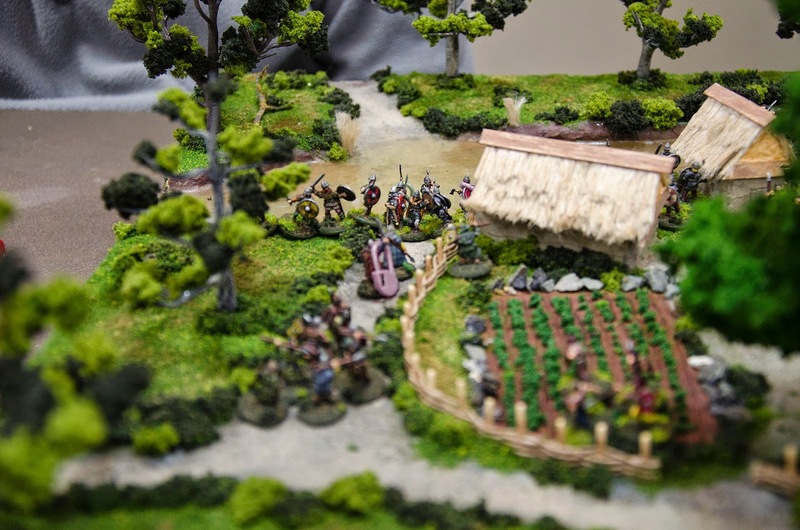 More fighting at the left ford as Onuis's troops rush to support. 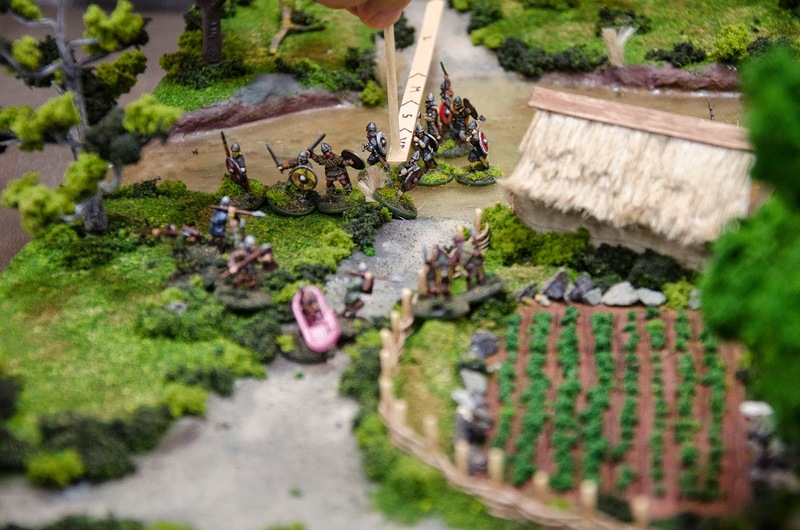 Northmen, while the warriors follow on foot. of the board all game, but now decide to wade into the stream and get into the fight. 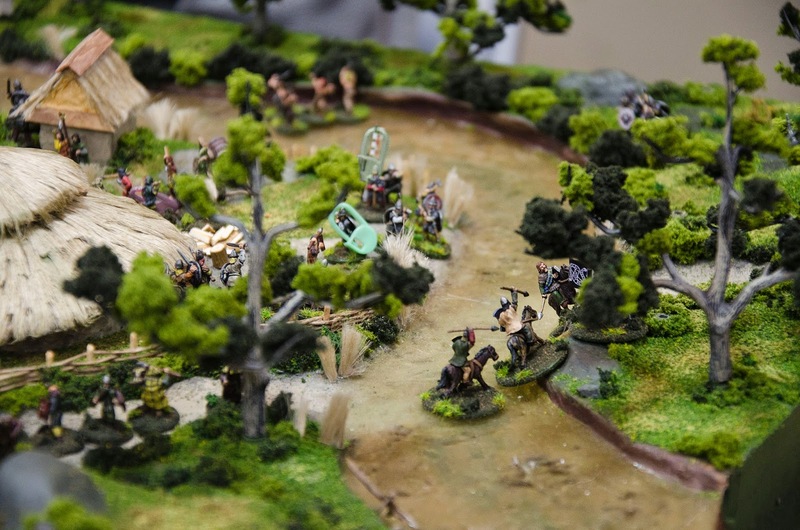 Northmen gain the other side of the ford and get ready to beat off another Pict attack. bloody. Onuis has ridden around behind them and has them somewhat surrounded. 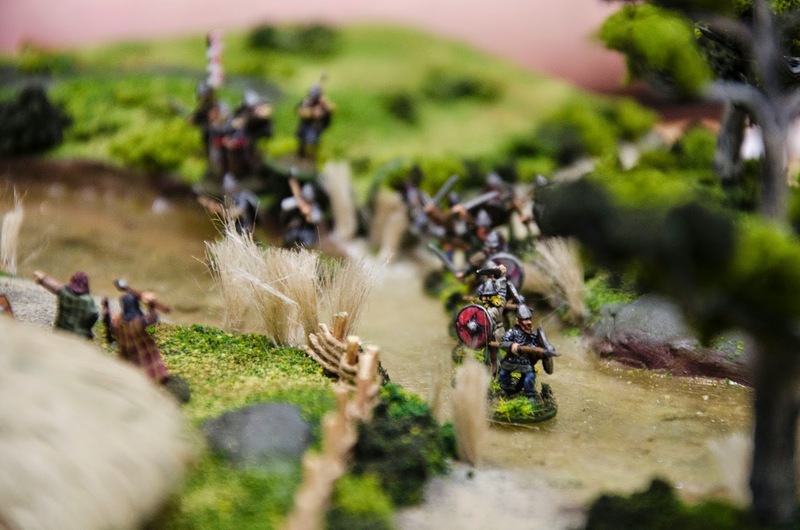 More Northmen cross the left ford, but they have a lot of Picts arrayed against them. slaughter the inhabitants, then set the buildings afire. 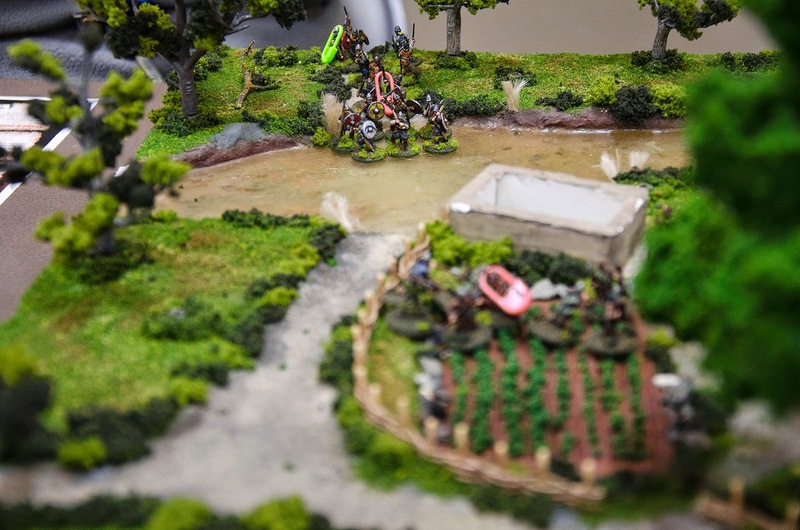 At the end of the game, Drosten's troops were slain to a man (though one Hearthguard managed to survive for turn after turn against terrible odds... the future subject of an epic poem, perhaps? ), but he had managed to put a lot of hurt onto the Vikings. A few of Onuis's troops remained, having mostly fought on the right side against Hadwin. Hadwin lost a lot of troops, but he survived and had the distinction of killing both of the opposing warlords. Snorri lost a few men and killed a few men, but he was the one who was most able to achieve his aims, burning and murdering the inhabitants of two of the three buildings. I thought the rules worked quite well for a 4-player game. 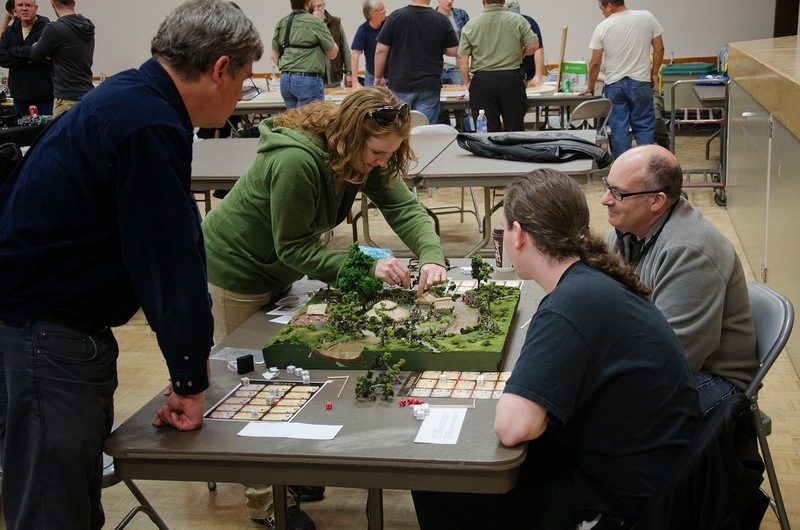 The learning curve is a fairly steep for people to just pick up the game and be confident in playing it, because the battle boards are a bit much to absorb all at once. 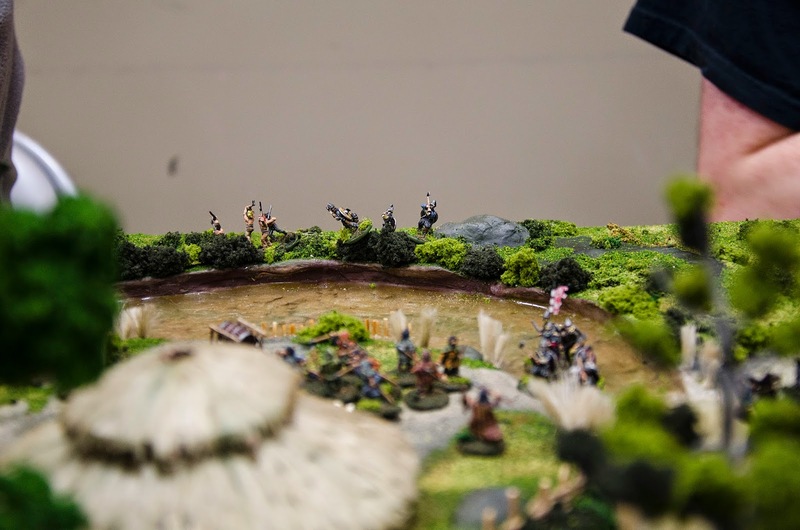 My lovely wife thought that she would enjoy the game a lot more after having played it a few times, when she would have a better idea of what each warband was capable of and how their abilities worked. Also, next time I should remember to bring some fatigue counters, so we don't have to use her knitting stitch markers! Great looking table and setup!